Table covers and runners are offered in a wide range of sizes and styles, making it easy to add a polished look to any table top. 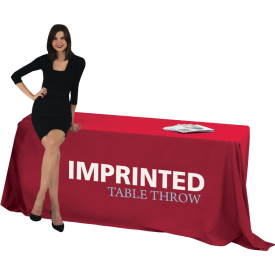 Quality custom imprinted table covers are offered in 6ft and 8ft sizes, as well as dye-sublimated printed table covers and table runners in a variety of styles, sizes and lengths. Table covers and runners offer the perfect opportunity for additional messaging and branding with limited space. Custom, dye-sublimated graphics come in 11 fabric colors and 21 vinyl colors, and allow brand & product promotion. Table covers can provide the perfect place to hand out literature, merchandise, product giveaways & more. 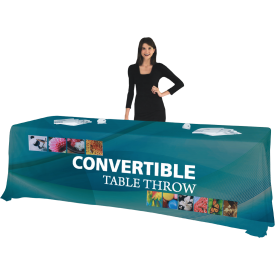 Easily add a polished look to any indoor or outdoor trade show or event display with a table cover solution.